Use their gun for 1 shift per day and you’re covered for 24 months, use it for two shifts and that’s cut in half to 12 months; run it for 3 shifts and the warranty gets cut in half again to just 6 months. 5 Full Years with U.S. based parts and service. No. Wagner systems are manufactured as box or hopper feed systems. Yes. 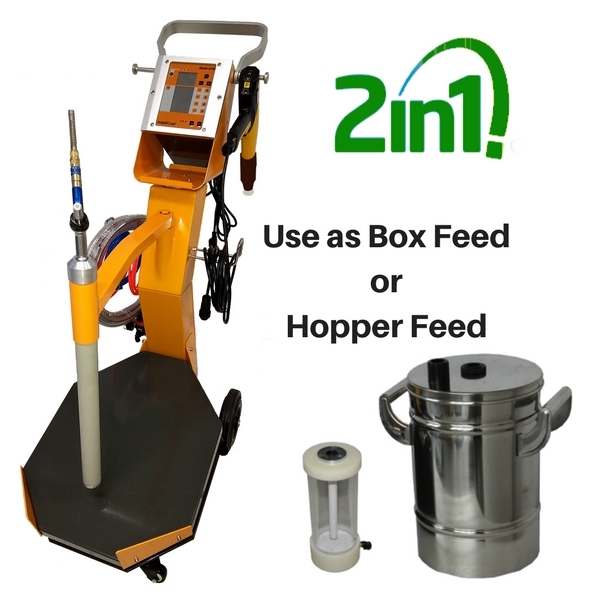 IntelliCoat systems can be used as box or hopper feed systems and come with two free bonus hoppers (2 liter & 10 Liter). Yes. Wagner systems can hold up to 47 powder recipes in memory. Yes. IntelliCoat systems can hold up to 20 powder recipes in memory. Wagner uses a quick purge button on the gun to partially clean the powder path from the pump to the tip, however several users of their guns have told us that it’s still necessary to dismantle the gun head and hose each time to thoroughly clean the gun for the next color. Average color time change is approximately 2 to 4 minutes. Color changes with IntelliCoat guns are done the traditional way, blowing clean the powder hose, pump and gun. Average color change time is 3 to 4 minutes for box feed changes and 4 to 6 minutes for hopper changes. 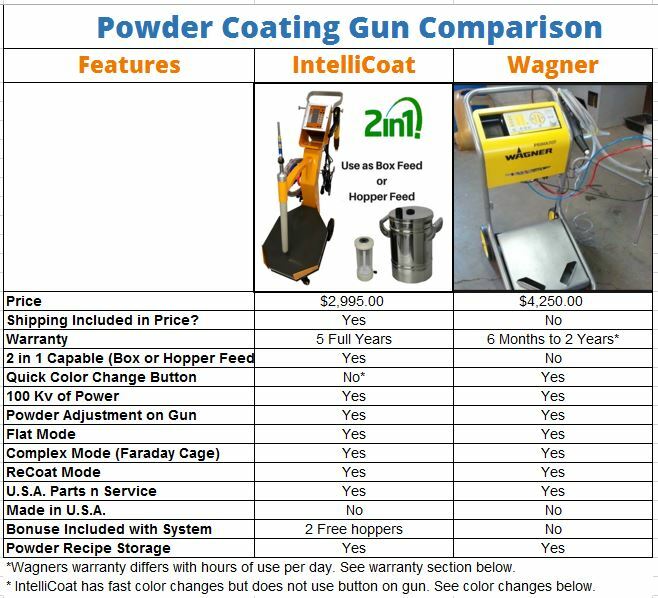 Learn More about IntelliCoat Powder Coating Machines Here.